In 1995, LtCol Dale Tietz and Dr. Bill Stone reviewed the data from the Clementine satellite mission for the first time together. Tietz, who had directed space-based portions of the Pentagon's Strategic Defense Initiative (SDI) program, pointed out the strong possibility that constituents of water were detected by bistatic radar returns at the South Pole of the Moon––specifically at Shackleton crater. NASA and SDI scientists were ecstatic! Stone, who had developed designs at the National Institute of Standards and Technology (NIST) to boost expended Space Shuttle external tanks into orbit and convert them into industrial laboratories and propellant depots, saw something else in the data. His team had calculated the propellant needs for landing commercial spacecraft on the Moon. In the Clementine and Lunar Prospector data he realized––that with unlimited quantities of lunar ice in the deep, cold trap craters––the opportunity to generate large quantities of rocket propellants at Shackleton and Low Earth Orbit (LEO) to refuel vehicles in cis-lunar space. The real moneymaker was to ship raw water to LEO for processing into liquid oxygen/liquid hydrogen propellants to then sell at significantly reduced prices than anything available on Earth--on demand--to all space farers. In November 1996, the Clementine mission reported detection of water ice on the South Pole of the Moon. Image credit: NASA. 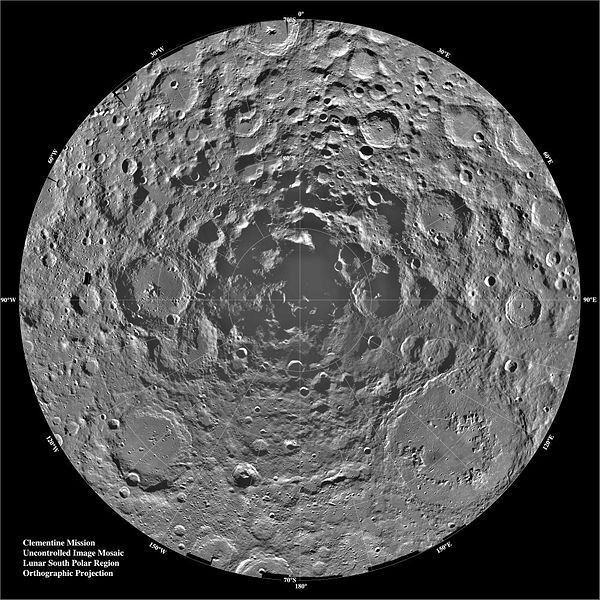 On 5 March 1998 it was announced that data returned by the Lunar Prospector spacecraft indicated that water ice might be present at both the North and South Lunar Poles - in agreement with interpretations of Clementine results for the South Pole. Image credit: NASA. This concept would forever change the logistics and economics game of operating beyond LEO in space, despite the fact a national decision was make to cancel Stone's futuristic Shuttle tank program and leave it to industry to work the problem. Over the next 12 years Stone and Tietz continually refined the business calculations and expeditionary implementation plan to deliver lunar propellant and life support consumables to LEO and do so at a profit. The plans were kept quiet because it was felt, until 2007, that the demand side of the business was not sufficiently defined. The advent, beginning in the fall of 2004, of a viable and burgeoning space tourism industry bent on delivering paying passengers to eventual hotels in LEO and beyond, convinced the team that it was finally time to go public with the concept. In March of 2007, Stone discussed the topic at the TED conference in Monterey, California along side Richard Branson. In 2008 Shackleton Energy Company was founded with Jim Keravala who expanded the project into a full space infrastructure program. The SEC Business Plan is complete and we are now in discussions with investors throughout the world. Public Domain, from "The Heart of the Antarctic", Volume I, by E. H. Shackleton, 1909. P. 364. 1. The man: Sir Ernest Shackleton, who led three British expeditions to Antarctica in the early 1900s, is considered one of the world’s greatest explorers of his time. He was all about extraordinarily bold leadership, endurance and beating the odds. 2. The crater: The South Pole lunar crater called Shackleton Crater in the honour of the explorer, was proposed by NASA in the 2004 timeframe to be the primary landing site for human return to the Moon. This crater coincidentally is also one of the most lucrative mining sites that contains hundreds of millions of tonnes of lunar ice ready for extraction and rocket propellant production, as well as other volatiles for life support. 3. Energy: In addition to naming our company for the explorer and the crater, we also call it an “energy” company. We are geared to produce water and in space water can be used to produce energy for power (rocket propellants), life (living, breathing, growing) and manufacturing. U.S. Air Force pilot, major system acquisition manager, Strategic Defense Initiative program manager, business developer and pioneer in unmanned aviation, Dale joined SEC as the President to turn goals into reality. With over 40 years of aerospace experience, Dale’s unique background, talent, international networks and zeal to do what others often say is impossible motivated him to team with Bill Stone to make SEC a winner. World-class explorer, inventor and engineer, Bill Stone has over 35 years of experience in Government and industry that has led him to the conclusion that exploring the Moon for ice and deploying "gas stations in space" as a private venture is the right project, at the right time, employing the right resources to do the right thing for humanity. “When we are successful, then all who participate in it will go down in history as those who were responsible for truly opening the space frontier in our time––a pioneering effort that many said could not be done. Water on the Moon is literally the feedstock for the next major Gold Rush in space." Jim comes to SEC with an exemplary 25 year background in space development and operations. Instrumental in the launch of over a dozen satellites, he was also involved in the establishment of new space programs for emerging space nations. Jim combines systems engineering and entrepreneurial drive to build long term infrastructure vision based upon near term capital requirements in his role as architect of SEC's program. Jim also leads SEC's Middle Eastern, European and Russian operations teams. "We are Go for the greatest and most profitable endeavor in human history. With our depots in space and crew on the Moon, we'll have boots on the ground and set a foothold to the stars." As a global innovation strategist Erika has led several corporate restructuring programs in banking and telecom sectors as an engagement manager at McKinsey. She is the Founder of the Human Project program addressing space, technology and other key sectors influencing humanity's growth and affecting our future. Erika has used her experience in corporate strategy to refine SEC's business plan and global partnerships. "Industry on Earth would be unimaginable without a transportation system of refuellable vehicles. That's what we must build outside the Earth's atmosphere to do all the great things we want to do in space, from geostationary solar power stations to settling Mars. The first step is an orbital fuel station with lunar supply chain of fuel. There is just no way around it." In the 21st century we will redevelop the ability to leave the Earth and continue where we left off with exploration, not just to the Moon, but with objects much further away; near Earth objects, the satellites of Mars, and someday maybe even going down to the surface of Mars itself. SEC maintains active relationships with many government organizations worldwide. In particular, the following information is provided to assist US Government clients with validation and verification of SEC registration in www.sam.gov for official US business: Shackleton Energy Company, CAGE Code: 6GBA5; EIN: 27-5170014; DUNS: 968028998. All SEC operations are compliant with US Government restrictions on Export Control Laws including ITAR. We've led 44 expeditions to some of the harshest places on Earth and built highly complex robotic systems where life depended on performance. Below is the video footage from our expeditions where we were testing our robotic & engineering systems in harsh environments on Earth. One of the world’s foremost deep sea divers committed to pushing the boundaries of human exploration on Earth’s last remaining frontier––in search of aquatic lifeforms yet to be discovered. Researcher at Hawaii’s Bishop Museum and fellow at the Eric Schmidt Ocean Institute. SEC partner for all space inflatable technologies. "I spent most of my career as a NASA Flight Surgeon doing direct mission support and providing care for the astronauts - on Earth and in space. Being the Chief Spaceflight Medical Officer for Shackleton is a rare opportunity to take it to the next level of human destiny - making large scale industrial-level human space operations a reality." "My clarion call is to tackle the challenging problems of enabling our crews to operate and survive in harsh radiation, microgravity and extreme temperature environments". "Living on Mars--Fact or Fantasy"
As NASA gears up for a crewed mission to the Martian system in the 2030s, or exploring the moon even sooner, one former chief of flight medicine at the Johnson Space Center has voiced concern. Astronauts will face real biomedical risks in deep space, especially on long-duration missions, said Jim Logan, former chief of flight medicine who retired from NASA in 2012. AsNASAgears up for a crewed mission to the Martian system in the 2030s, or exploring the moon even sooner, one former chief of flight medicine at the Johnson Space Center has an important message: not so fast. Astronauts will face real biomedical risks in deep space, especially on long-duration missions, said Jim Logan, who retired from NASA in 2012. Many risks are already identified because they’ve been studied in crew members aboard the International Space Station, he said — loss of bone density, loss of muscle mass, including to the heart muscle, changes to the immune system and many other effects caused by the near-weightless environment. The biomedical challenges of weightlessness are significant, Logan said, especially considering there are no known technologies in place or even considered to address them as humans prepare to embark on longer deep-space voyages. Meanwhile, scientists are well aware that cosmic and solar radiation will hector humans once they venture beyond Earth’s magnetic field. Still, there likely remain many other biomedical challenges that the world’s best minds haven’t even dreamed up yet. “What we’ve learned in 57 years of human space flight is that, during short-duration missions, you can do just about anything you want as long as you take the environment with you and your crews are adequately trained,” Logan said in a phone interview Monday from his home outside Dallas. And on Aug. 7, he’ll be making a free public presentation on the biomedical challenges of deep-space missions at the Virginia Air & Space Center in downtown Hampton. He’ll be appearing at 7:30 p.m. as part of the Sigma lecture series sponsored by NASA Langley Research Center. Doris Hamill, a physicist at NASA Langley, suggested Logan for the series. “Some of the most difficult challenges that humans face as they begin long-duration exploration of deep space involve not engineering challenges, but human health and performance problems,” Hamill said Monday. Even before Mercury astronaut John Glenn took his historic three-orbit ride around the planet in 1962, physicians worried that weightlessness might render him unable to speak, hear, see, swallow or even think straight. Glenn proved them wrong, finessing every test they threw at him in his capsule. But, even from the early days of spaceflight, Hamill said, medical observers have noticed changes in the human body as it adapts to the new environment of space. Some changes have been “quite serious and worrisome,” she said, although not shared publicly because they’re considered private medical information. In 2015, though, NASA astronaut Scott Kelly did agree to go very public and live aboard the space station for nearly a year so that scientists and doctors could learn about microgravity’s effect on his physiology and psychology, comparing his data with that of his identical twin, astronaut Mark Kelly, who remained on Earth. Among those effects, aside from the expected loss of bone and muscle mass: Scott Kelly grew by 2 inches and 7 percent of his DNA changed. This, after less than a year in near-weightlessness. Gravity is so critical to human health, Logan said, that he believes it should be added to the list of environmental parameters necessary for a deep-space journey, much like cabin pressure, water and food. “What you don’t want to do is, you don’t want to send healthy astronauts on the way to Mars and, by the time they get to Mars, they have the bones and muscle mass of a 70-year-old,” he said. The Martian surface has about a third of Earth’s gravity; the lunar surface, about a sixth. One solution could lie in a Japanese experiment that showed some promise aboard the space station: Mice placed in a centrifuge for a short period every day were found to have lost less bone and muscle than mice that weren’t getting the G-force treatment. But just how important is some form of gravity therapy for humans in deep space? Nobody knows for sure, Logan said, and that’s actually the point. The biggest hurdle to deep-space missions, though, continues to be exposure to deadly space radiation, a challenge that NASA and others are working on. The hurdle isn’t insignificant: Once beyond Earth’s magnetic field, humans will get hit with a constant radiation dose about 180 times that on the Earth’s surface. Logan says he’s not against deep-space exploration. Not by a long shot. So far, he said, spaceflight engineers and astronauts alike don’t seem to be taking his concerns as seriously as he is. “Astronauts don’t want to say anything that would impede astronauts’ being able to fly on a mission — especially to Mars,” said Logan. “They don’t want to be held back. The way to become a successful interplanetary species, he said, is by first avoiding the Buck Rogers kind of “magical thinking” — landing 1,000 colonists on Mars, for instance — and facing reality. The first 50 years of spaceflight was largely an engineering challenge, he said. The next 50 years will be primarily about life science. "Penguin Automated Systems in Sudbury Canada has years of experience in terrestrial mining and concepts for mining resources (ISRU) off Earth. Working with the Shackleton Team we have the best chance of mining the Moon for water and other volatiles as feedstock for affordable rocket propellants and the ingredients to support human operations."